Someone would have to sit down and do a really deep think through of existing road laws and regulations when self-driving cars become more and more commonplace. What happens when the data received by the vehicle is incorrect, and the car actually breaks the speed limit, all the while when you are sipping on your Starbucks mocha at the back seat, reading up on all that is happening in the world on a tablet? I suppose humanity will cross that particular bridge when they arrive at it, but otherwise, it remains something to chew over at this point in time. Toyota has already demonstrated a self-driving car over at CES 2013, although there are still some lengths to go before something like this is perfected for everyday and safe use. The ride, a luxurious Lexus LS600, has been outfitted with its fair share of radars, cameras in addition to an array of sensors which enables it to be more than just cognizant of its immediate environment. 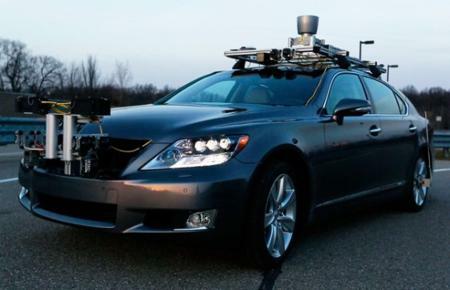 Toyota is not the first to create a driverless car, as Internet search behemoth Google was first to do so, and has been behind the wheel (literally) since 2010, working on refining its technology. Needless to say, there is nothing quite like some competition behind you to spur you on to greater heights, and we as the consumer will only be able to say that we win out in the end. The experimental car from Toyota is currently able to avoid collisions with pedestrians and other automobiles, where it will get up and about based on detailed electronic map data which is able to accurately perceive roadway information including traffic lanes and signals. I guess with this, you can truly drink those non-sobering beverages without having to worry about arriving at the destination while endangering the life of others on the road.